As many of you know, the Davis Bike Club had a hand in the creation of RUSA (Randonneurs USA). You can read more about that history here. August 19th marks RUSA’s 20th Birthday and rando-regions across the US will be hosting rides to celebrate the date. We will be riding a new route that has been a staple for many local randos called The Real McCoy, created by Bill Vanderslice. Thanks Bill! 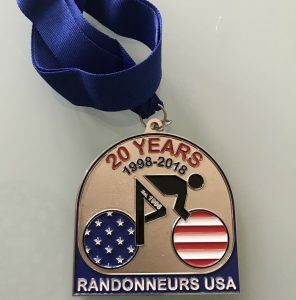 Riders who complete the ride will earn a special 20th Anniversary RUSA medal and a 20th Anniversary patch. Since Davis has a long history in randonneuring in the US, we hope that many riders will join us as we head out to the Delta, and then from Rio Vista to Suisun and Fairfield riding up Pleasant’s Valley Road with a stop at Berryessa for refreshments, and then back to Davis for 126 miles. It would be great if local randonneurs and others who are interested in what rando is all about, came out and enjoyed the day. Registration for the Birthday ride and the rest of the Fall calendar of brevets is here or for a direct link to registration, here. Hope that many randos who have moved away from the sport, or are taking a break, will dust off their rando-bags, pump up their tires and join us on August 19th.